Beginning in June, we’re asking all employees with work-from-home arrangements to work in Yahoo offices. If this impacts you, your management has already been in touch with next steps. And, for the rest of us who occasionally have to stay home for the cable guy, please use your best judgment in the spirit of collaboration. Being a Yahoo isn’t just about your day-to-day job, it is about the interactions and experiences that are only possible in our offices. Employees at Yahoo are upset, and feel like Ms. Meyer is changing employment terms that Yahoo has previously agreed to. Many employees who work from home apparently would not have taken the job at Yahoo had they not been allowed to work from home. According to the HR email, this is a new policy across the board for all employees. Period. I get that Marissa has a tough job ahead of her. 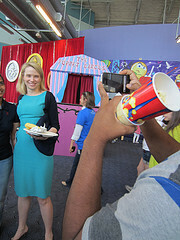 She is the 6th CEO in 5 years at Yahoo. The company is faltering and losing ground. The future of Yahoo is anything but secure. Marissa has been seen by many to be Yahoo’s last ditch effort to turn it around. Some people think that she may actually be the scapegoat for Yahoo, a company well on its way down a death spiral. She has to act quickly. She needs to make some big changes. People are expecting her to get in and start moving the needle immediately. The only CEO in the fortune 1000 that has ever been pregnant while being CEO. Making some bold moves surrounding HR and culture is probably a good idea. But why has she chosen flexibility in the workplace as a major issue to tackle? Recently it became known that she spent money remodeling her enormous executive office in order to have a baby nursery for her newborn son at Yahoo next to her office. Don’t get me wrong; I applaud her for where she is in her career. I applaud her for getting the job as the CEO of Yahoo while pregnant. In fact I don’t just applaud, I cheer! But because of this she should know better than anyone that in order to support other working women, particularly working moms, flexibility is the holy grail. Business Insider recently reported that Marissa paid to have a nursery built next to her corner office at Yahoo. Some employees are wondering how Marissa will feel if they commandeer the cubicle next to the new one they have been assigned, now that they can no longer work from home, so that they too can convert it into a nursery and bring their baby into the office? To be fair, no one knows whether Marissa will support someone who wants to bring a baby to the office as she does. But the message she is sending is that flexibility is no longer valued and, instead, working on-site and face time are more important. Why not make a big statement about results and productivity? Why not emphasize that the new Yahoo is focused on everyone producing as much as possible towards a common end goal? We all know Yahoo has major issues that need to be fixed. We know Marissa is under the gun to prove herself. But it is just inexcusable to me that she not recognize her position as a woman leader. Why not use that position to help advance working moms? As the CEO of my company I brought all three of my boys as infants into my office. But I am not the only one. We have had 3 other babies in the office as well (we are a small company with 50 employees). Currently baby Grace, daughter to one of our senior developers, comes into the office almost every day. Her mom brings her, along with a pack and play, and little bouncy chair, a Baby Bjorn, a stroller, and various other accoutrements to help her care for Grace, while still being present and doing her job for us. And you know what? Everybody wins. We get our senior developer in the office working on our products, rather than home on maternity leave (her choice – we certainly would not have had any problem with her taking maternity leave). She gets to continue to further her career and lead the development on our most important product, and Grace gets to be with her mommy virtually every day. And most importantly I put my money where my mouth is. I support working moms and give them the flexibility that they need to work hard, produce results, and continue to advance their career. I understand, because I live it everyday, that the only way for me to do what I need to do at home, and at the office is to be able to have complete flexibility. It disappoints me about Marissa. I wish that she would show everyone what it takes to be a new mom and the CEO of Yahoo and then afford all her employees the same luxuries. I truly believe that the next wave of feminism needs to be carried by working moms. We need to put our foot down and not accept being “mommy tracked”. We need to speak out and demand the flexibility we require and then show the world that we can out-produce anyone. A version of this post originally ran on March 4, 2013 in my blog at Forbes Women. Images via jencu and Shutterstock. Website madness, or How I discovered Yahoo has maps. “Unlimited” Web hosting courtesy of Yahoo!